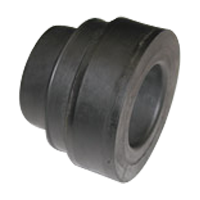 LSR Housing Stripping Rubber | Global Elastomeric Products, Inc. Tubing stripper rubbers have been used for decades to help provide safe and cleaner working environments when running or pulling tubing string. As tubing goes in or out of the hole it is wiped by the LSR or other stripping rubber to minimize fluid waste. The LSR Housing is used to hold the LSR housing to help provide a clean and safe working environment. As moving tubing string through the LSR, the housing secures the LSR in place to reduce movement of the LSR.